...that the Spider owns a large collection of art from ancient human civilizations? ...that the Sword Heavy Weapon class was first introduced in The Taken King? ...that prior to Destiny patch 1.0.2, Legendary Engrams had a chance to decode into Rare-level items? ...that before The Dark Below was released, players had to use Ascendant materials to fully upgrade Exotic armor and weapons? "Nostalgia as a weapon of war. Style as a hallmark of victory." 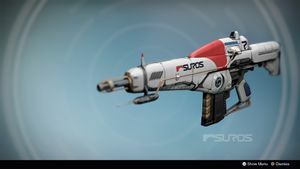 The SUROS Regime is an exotic Auto Rifle introduced in Destiny Year One. A Year Two version of the SUROS Regime was available in The Taken King, as well as being introduced again in Destiny 2 via Warmind. Nostalgia as a weapon of war. Style as a hallmark of victory. Suros engineers designed the Regime using recovered Golden Age schematics. Forced out of production by a crippling shortage of smartmatter, the few remaining models are cherished by those Guardians fortunate enough to wield them. Few weapons have withstood the test of time longer than the trusty SUROS Regime. This is Golden Age tech brought to life by the fastidious engineers at SUROS. Its smart-matter frame is prized among Guardians for both efficiency and rarity. Some things never fall out of fashion. When fully upgraded, the perk SUROS Regime allows the bottom half of each magazine to deal bonus damage and has a chance to return health when dealing damage. In addition, the perk Focused Fire increases the weapon's damage at the cost of reducing its fire rate. It is a capable weapon in the Crucible and in lower level Strikes. It has low recoil, a magazine of 33 rounds, and does high damage per impact. The Year Two version of the SUROS Regime retains the SUROS Regime and Focused Fire perks, but adds a new perk called Spinning Up that increases its fire rate the longer it is fired. Spinning Up and Focused Fire are interchangeable. The SUROS Regime's aesthetics have also been changed. Field Choke: More range and impact. Increased recoil. Linear Compensator: More predictable recoil. Slight boosts to range and impact. More recoil. Smart Drift Control: Predictable and controllable recoil. Penalty to range. Spinning Up: The longer this weapon is fired, the faster it fires. Focused Fire: When zoomed, this weapon fires slower, but causes additional damage. SUROS Legacy: Bonus damage with bottom half of magazine. Chance to return health when dealing damage. Hammer Forged: Improved range and accuracy. Lightweight: When held, this weapon grants +2 character Agility. SUROS Legacy: The bottom half of each magazine deals bonus damage and has a chance to return health on kill. Spinning Up: Holding down the trigger increases rate of fire. Dual Speed Receiver: When aiming down sights, weapon rate of fire slows while weapon damage increases. "It’s a sleek beast from a simpler time – a death dealer wrapped in nostalgia." It was known as the "Arcus Regime" during development. A desktop wallpaper of the Regime. First-person view of the Regime. Side model of the Regime. Extracted side view of the Regime. Concept art of the SUROS Regime. Side view of the SUROS Regime. The SUROS Regime's changed aesthetic. The two available ornaments for the SUROS Regime. The SUROS Regime in Destiny 2. SUROS Regime overlay with the Coup the Main ornament. Browse more images on this article's gallery page. ↑ Planet Destiny: Vault Space Increased, Infusion, and Swords!